Jesus did not come simply to get man out of hell and into heaven. 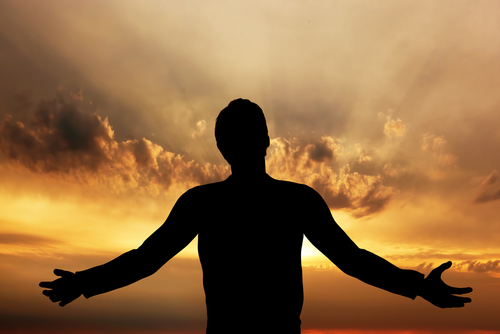 His ultimate goal was to get out of heaven and back into man. Well amen to that! 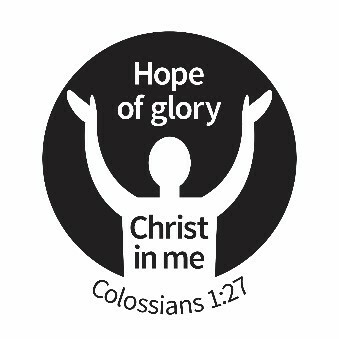 That’s the mystery of our faith found in Colossians 1:27: “Christ in us the hope of glory.” Jesus died for us to give His life to us to live His life through us. Can you pinpoint a specific time when you gave your life to Christ? Not a time when you were baptized, not a time when you were dedicated by your parents, not a time when you said a prayer. The test is whether or not there was a moment in time. This moment in time is when you established a personal relationship with Jesus Christ and gave control of your life over to Him. If you can’t remember, then you may never have taken that step of faith. Only you can answer that question. Christianity is not a self-improvement, it is a self-replacement. He does it all, that’s the truth, the whole truth and nothing but the truth, so help me God! Jesus doesn’t make us better, Jesus is our better. He who began a good work in you is faithful to complete it. The greatest test you can take is to examine yourself and to realize that Christ Jesus is living in you to live His life through you unless, of course, you fail the test. Pass or Fail, You Be The Judge! 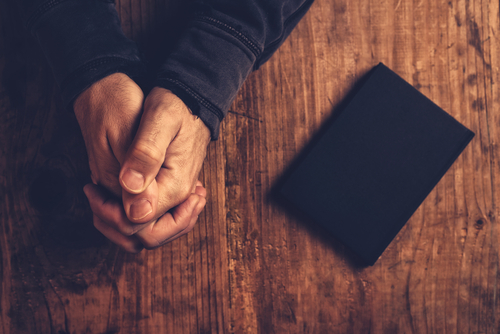 With the thousands of books written on prayer, it is obvious that Christians continue to seek out helpful ideas for enriching their prayer life. As part of your journey down “The Galatian Road,” you have seen continued references to our core verses, Galatians 2:20 and Colossians 1:27. These are only 2 of the 242 verses in the New Testament that describe the living presence of our Lord in His followers – you and me! At Growing in Grace Ministries we believe praying by directing your requests and praises through Christ Jesus who lives in you is an enormous blessing and benefit in how one prays. Examples like: Don’t ask Jesus “Help me be more patient,” but rather, “Jesus, be my patience in this situation.” Or, “Reveal Your patience through me in this situation.” Then, WWJD, watch what Jesus does! Some may ask, “What is His purpose in living His life through my work, my social activities, my family, my worship and everything else? “ Scriptures describes all believers as His body, His arms and legs, His hands and feet. He uses us as instruments of His righteousness, as a branch to bear fruit and for His will and way to be done. Do you remember the illustration of the tea bag and the hot water? The fusion became so great, that even while the water and tea are separated by the tea bag, we still call the water, tea! But the water is not the tea; it’s the tea in the water. Well, the fusion of His life with ours is so great, we call our actions “Christlike,” but it is NOT us, it is Christ in us who is doing His work through us. What work does He want to do through us between now and His return? He wants to live and pray in the Spirit through us as instruments of His righteousness. Why does He want to live in and pray through us? So we can participate in His Divine nature and to give us the privilege of being an eye witness to the fulfillment of His plan here on earth. It is because of the Christians’ position of absolute unity with the Father, Son and Holy Spirit that we pray for the will of the Lord to be expressed through us. And, all for the glory of God. Dear Lord, the people at work are sometimes very difficult to show love to. Pour out Your love through me, to those I find hardest to love, when I am at work. Thank You in Jesus name. Father God, even with 242 Scripture verses that describe You living in me, it is still hard for me to wrap my mind around. Please continue to transform me, renew my mind and live out Your will and way for my life. In Romans 6:13 Paul tells us to offer the parts of our body to Him as instruments of righteousness. In John 15:5, Jesus describes us as a branch to bear fruit to be used for His will and His way. Jesus as the vine for the branch wants to continue His ministry through His body of believers, so that He can get as many people into the kingdom of God before He returns to rule and reign. While on earth, our Lord set His deity aside and was fully man allowing the Father to fulfill His purposes through Him, so He would be an example for us of how the Spirit filled life is lived. Jesus lives in us and His Spirit prays through us, just like the Father did with Him. LIFE LESSON: What a privilege to be used by the Lord as a temple for prayer; His life and His prayers being lived and prayed through us. Last things first today. 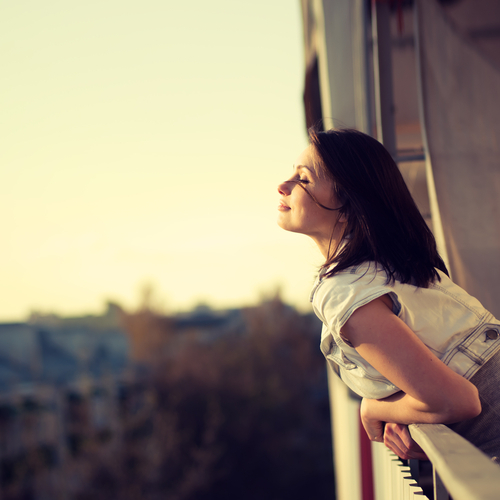 My first thoughts of you are for a powerful monthly Life Lesson. My last thoughts are about money. However, last things first today only! Many of you know that our Growing in Grace Ministry has been funded by able partners for 20 years. In the last few years however, some have retired and some have gone to be with the Lord. NOW, ON TO OUR MONTHLY LIFE LESSON TO INFORM YOUR MIND AND UPLIFT YOUR SPIRIT. “The kingdom of heaven is like treasure in a field. When a man found it, he hid it again, and then in his joy he went and sold all he had and bought that field.” Matt 13:44 That man was blessed beyond belief! Every born again Christian is also blessed beyond belief with every spiritual blessing in Christ Jesus. (Eph 1:3) However, most Christians are not experiencing these blessings in their daily life because they do not know that they have them. And if you don’t know that you have them, it’s hard to experience the riches of the blessings. Here is a true story to illustrate my point. During the great depression a man in East Texas owned a piece of property where he raised sheep to make a living to support his family. Because of the depression he was struggling to make ends meet, and also was about to lose his property because he couldn’t pay the small amount of property taxes that were coming due. An oil company approached him saying, “We think there may be oil on your property and we would like your permission to drill a well.” With nothing to lose he gave them permission. After a few days of drilling they struck one of the largest oil deposits ever at that time which eventually produced over 80,000 barrels of oil every day! Almost overnight he became a very rich man worth millions, blessed beyond belief or was it truly overnight? Let’s think this through. Actually he was a “blessed beyond belief” millionaire the day he bought the property. Isn’t that true? The oil was always there, but he just didn’t know it. Again, if you don’t know you have it, it’s hard to experience the riches of the blessings. For born again believers all the spiritual blessings are there to experience. We have the divine nature, the fruit of the spirit, the spiritual gifts, the power over sin in Christ Jesus, etc. We have every blessing in Christ Jesus we need, but like the man in Texas; if we don’t know we are rich in Christ Jesus, we probably won’t experience the blessings. A solution would be to examine the scriptures to find the truth about these blessings. Better yet, “Examine yourselves to see whether you are in the faith; test yourselves. You see the truth is: Jesus lives in us to live His life through us. He is the reason we have every spiritual blessing, and we are blessed beyond belief. LIFE LESSON: “His divine power has given us everything we need for life and godliness through our knowledge of Him who called us by His own glory and goodness.” II Peter 1:3. Once you know the truth, the truth will set you free. We are blessed beyond belief. DO YOU BELIEVE THE STORIES IN THE BIBLE? Then the man said, “You actually believe that a man was swallowed by a big fish and lived in the belly of the fish for three days?” “Oh, you mean Jonah. Of course I do, it’s God’s Word and it’s in the Bible.” she replied. Have you ever heard people say they can’t believe the Bible because it contains “hard to believe” stories like Jonah and the Whale or Noah and the Ark or God’s creation in six days for that matter. Even if we could prove these stories in the Bible, would it be enough for them to come to know Christ as Lord and Savior? The truth or validity of the Bible is not dependent on proving if these stories are true. The validity of the Bible rests on the question “Who is Jesus?” If Jesus is God creator of all things, we can trust what He says about what’s in the Word of God. And if Jesus is not God, who cares? Notice that Jesus compared Jonah being in the belly of the whale for three days and three nights to the fact that he would be three days and three nights in a tomb before being raised from the dead. LIFE LESSON: So again the validity of the stories of Jonah and the Whale, Noah and the Ark, and God’s Creation in six days are true events not because they can be proven scientifically, but because Jesus is God, second part of the Trinity and He said they happened! Period! Praise God, the Creator of all things! And as an example of instruments, in 1 Corinthians, Christians are referred to as God’s temple, God’s building and God’s field. In 2 Corinthians, we are called tabernacles, tents, jars of clay, earthen vessels, perishable containers; all containing great treasure. And the great treasure that resides within us as an instrument, of course, refers to the mystery of our faith, Christ in us, the hope of glory. Another way of seeing ourselves as instruments that Jesus indwells is to think of the power tools in your home. When these tools are plugged into a power outlet they all use the same source of power, but each has a unique purpose. However, once unplugged, they all become the same – useless and incapable of accomplishing a purpose! It’s the power source that gives them their identities. Jesus is the power source, for all Christians. His death frees us from the penalty of sin. His life frees us from the power of sin. So stay plugged into the power source because apart from Him, we can do nothing. Now when we abide with the Christ life within, do we lose our identity and become like a robot? Absolutely not! God made only one of you. You have your own DNA, your own fingerprints, your own personality or soul which is composed of our mind, will and emotion. You are unique right down to the bone. When we were born again we obtained a new identity in Christ. We are now Christians, we are the body of Christ, and He is now our life, our strength and our power source. Isn’t it exciting to know that we are His vessels for His honor? Jesus died for us to give His life to us, to live His life through us. Christianity is not a self-improvement; it is a self-replacement. Jesus doesn’t make you better; Jesus is your better. You will never have a changed life until you experience the exchanged life. This should bring it all together for you! Remember, as a new creation, your identity is in Christ. “For you died and your life is now hidden with Christ in God and when Christ, who is your life, appears, you will appear with Him in glory.” Colossians 3:3-4. You are now a vessel of honor for God. Praise God for such a miraculous plan for our lives! We get to be part of His body and He uses us as a tool, etc., to work His plan until He returns. Think about it – we drive on parkways and park on driveways! We boil water to make hot tea and pour it over ice to make it cold, we put lemon in to make it sour, sugar to make it sweet. Then we say, “Here’s to you!” And, drink it ourselves! People are funny! The Bible teaches, we can do all things through Christ who strengthens us. It also teaches apart from Him we can do nothing, and when we are weak, He is strong! But yet, we still try to do all things ourselves. People are funny! I have been crucified with Christ and I no longer live, but Christ lives in me and the life I live in this body I live by faith… Galatians 2:20 Believe God’s Word!! So the next time you go to the mirror, forget looking at whiskers, shaving cream, make-up, etc., and instead look and receive what God’s Word proclaims about you as a born again believer in Christ. Do that for 21 days, better yet forever, and when you walk away from the mirror each day you won’t forget who you NOW are. But, people are funny. Some will; some won’t. Christians need to let the world see Christ in us. Does the world see Christ in you? 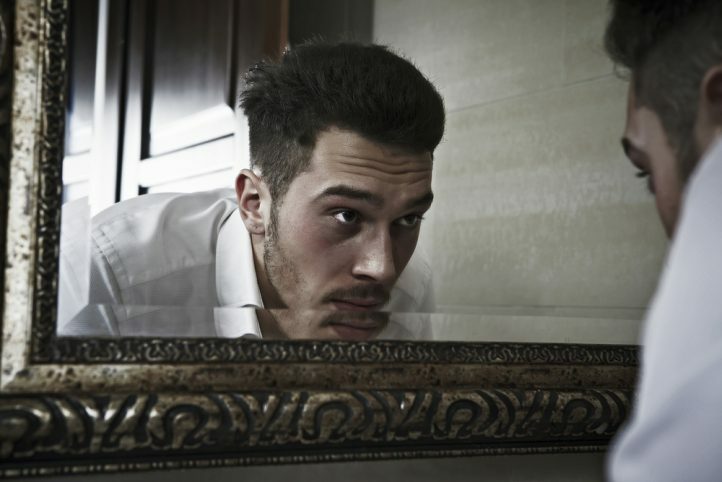 Equally important, do you see Christ in you when you look in the mirror. I pray you do!!! Is the Man staring back from the glass! God’s Blessings to you in this summer season from the team at Growing in Grace Ministries. We appreciate your continued prayer and financial giving as we are dependent upon the generosity of our friends. Jesus asks us to offer our bodies as a living sacrifice and to be transformed by the renewing of our mind. He also told us to pick up our cross daily and follow Him. I was reading an article on sacrifice and a question posed went something like this: “Are you willing to be poured out for others, to have them recognized and you ignored, to totally lose your life to be a door mat?” It went on and on, but you get the point of the challenge. I cannot rise to the challenge. I am weak. But this I would ask of you Lord: when the moment of pouring out comes, would You grant me the grace to turn to You, to recognize abiding, and thus let the life that has been poured out, your life, the life of Christ, be poured out again through me? Now some believe that the Christian standard is higher than any other, and that their job is to raise the bar for all of us. If that be true, I quit! I know myself, and in my flesh dwells no good thing. The standard that Jesus kept is higher because it was His Father doing it through Him, and the only hope I have is that Jesus does it through me. Once you know the truth, the truth will set you free. Glory be to God! The best book/biography on our Lord Jesus Christ that I’ve ever read is The Incomparable Christ written by Samuel M. Lockridge. Because it is short and to the point, I don’t know if one would call it a book, but why not? Philemon, II John, III John, and Jude are books of the Bible, and they are about the same length. And with Easter just around the corner, it is the perfect time to reflect again on the risen Savior. Enjoy the read. More than nineteen hundred years ago there was a MAN born contrary to the Laws of Life. This MAN lived in poverty and was reared in obscurity. HE did not travel extensively. Only once did HE cross the boundary of the country in which HE lived; that was during His exile in childhood. HE possessed neither wealth nor influence. HIS relatives were inconspicuous, and had neither training nor formal education. In infancy HE startled a King; in childhood HE puzzled doctors; in manhood HE ruled the course of nature, walked upon the billows as if pavement, and hushed the sea to sleep. HE never marshaled an army, nor drafted a soldier, nor fired a gun; and yet no leader ever had more volunteers who have, under His order, made more rebels stack arms and surrender without a shot fired. Once each week the wheels of commerce cease their turning and multitudes wind their way to worshiping assemblies to pay homage and respect to Him. The names of the past proud statesmen of Greece and Rome have come and gone. The names of the past scientists, philosophers and theologians have come and gone; but the name of this Man abounds more and more. Though time has spread nineteen hundred years between the people of this generation and the scene of His crucifixion, yet He still lives. Herod could not destroy Him, and the grave could not hold Him. HE stands forth upon the highest pinnacle of heavenly glory, proclaimed of God, acknowledged by angels, adored by saints, and feared by devils, as the living, personal Christ, our Lord and Savior. LIFE LESSON: He is risen, He is risen indeed! He’s alive! That says it all. And all God’s people said Amen!! Have a Blessed Easter from all of us at GIGM and thank you again for your continued prayer and financial support. S.O.S…our funds are low. God’s law, the prohibitions, the thou shall nots actually gives sin its power. We have all experienced it. You read a sign next to a pond that says “Positively no fishing”, and what do you suddenly get a hankering to do? Go fishing in the pond! Your mother lays down the law and tells you to stay out of the cookie jar, and all day long you have an urge to have a cookie! You see a sign that says “wet paint do not touch” and your response is to check it out. So you see the power of sin is in the law. By grasping this truth, you will understand one of the greatest misunderstandings in the church today. Jesus was letting us know that no man could keep the law, and that everyone needs a savior. The law, which is holy and perfect, was designed to convict unbelievers of their sin and their need for the Savior. Only Jesus Christ can save you from the penalty of sin that the law reveals. Only Jesus Christ can give you a right standing before God. Grace, grace, God’s grace, grace that is greater than all our sin. Amazing grace, how sweet the sound…Thank You Lord Jesus! We’re excited about the seven Galatian Road Bible studies currently in process. Please help us tell others about this Christ glorifying study! Now what was Jesus referring to when He talked about the new wine and the old wine skins? He was referring to the mixing of the two covenants. The new wine represents the new covenant of grace while the old wine skins represent the old covenant of law. Traditionally, we have been taught that hot means that you are going to church every time the doors are open, reading 10 chapters of the Bible per day, witnessing to everyone, and attending every prayer gathering you can find. But to be cold means to be just the opposite, you stopped doing these things entirely. These two verses have mostly been preached as though it were about our actions and behaviors, but Jesus said that He would rather we be cold or hot and not lukewarm. Now this would not make any sense if Jesus was referring to actions or behaviors, because wouldn’t being lukewarm for Jesus still be better than being completely cold. So why would He want the church of Laodicea to be cold if they were not hot? Let’s please put on our thinking caps. You have to test the message and make sure it is consistent with the gospel of grace. These two verses would only make sense when they are interpreted in the light of the mixing of the two covenants of law and grace in the church of Laodicea and in every church for that matter. I believe that’s exactly what our Lord meant. You see, if you were completely under law, it would lead you to despair and into the saving arms of Jesus. The law would unveil to you your sinfulness and inability to keep the full measure of the law, and this would cause you to see your need for His grace. But when you have mixture, where you believe in grace but grab hold of the law, you neutralize the convicting power of the law to bring you to the end of yourself so that you will cry out for the grace of the Savior. That is why you cannot be cold and hot at the same time or be for both law and grace at the same time. The moment you attempt to mix grace with the law, each covenant is robbed of its full effect in your life. You become lukewarm because of the mixing of hot and cold (law and grace), and God hates mixture and said He is about to spit you out of His mouth. Why? Because it robs you of the power to reign or prevail in life through the abundance of His grace. Be careful not to ignore the purpose of the law today. The law is designed to convict sinners of their depraved state; however it cannot offer a solution. Only Jesus Christ can cleanse us from the sin the law reveals. Although the law plays an important role in the world today, it has no place in the life of a born again believer. Now this is exactly what the Apostle Paul was saying to the Galatians when he explained to them the purpose of the law.